We start our historic review of tea cups during the Tang dynasty (618-906). 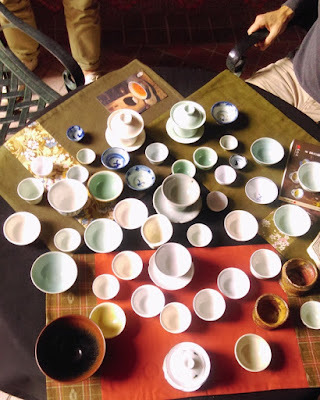 Then, they were named tea bowls (cha zan or cha wan). These bowls were rather large (13 cm) and flat (6 cm). This shape was the best fit for the way tea was drunk during that era. Different kilns produced bowls of different colors. Northern China produced mostly white bowls, while southern China made celadon bowls. 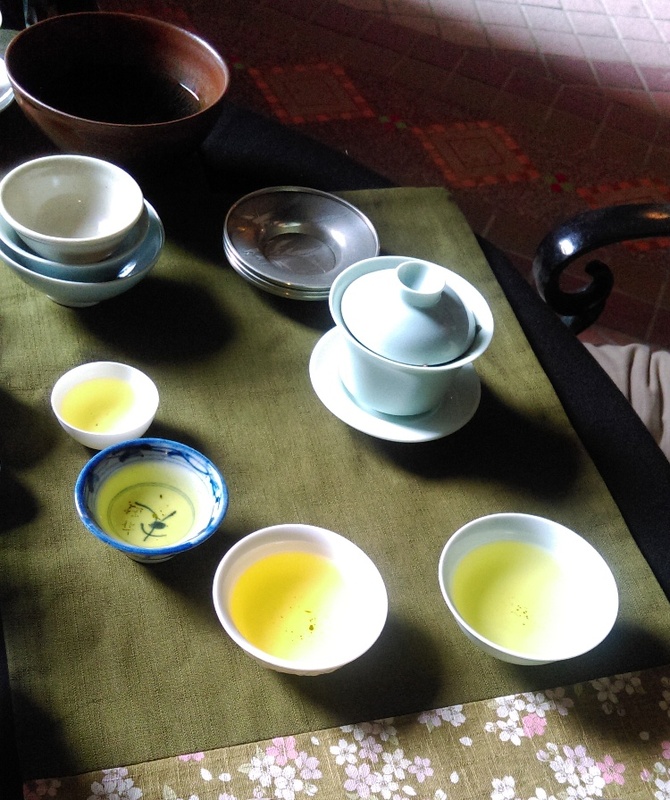 For Lu Yu, Yuezhou's celadon was superior to Xingzhou's white, because the color of the tea would look more transparent and green instead of red. Celadon was also appreciated, because its color was similar to jade, the most precious stone in Chinese culture. 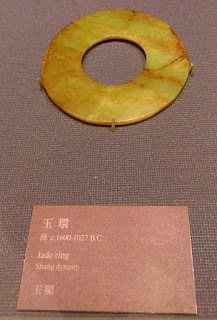 The connection to jade was so strong, that the foot of Tang dynasty bowl often looked like a jade bi disk. During Sung dynasty (960-1279), the tea bowl became black and its walls became higher to accommodate the tea powder whisking technique. When loose leaves started being brewed in a teapot during Ming dynasty (1368-1644), the tea cup was called 'zhong' for its bell shape. This cup was rather big, because it was used for green tea that is brewed light. It's only during Qing dynasty (1644-1911) that the name 'bei', cup appears. 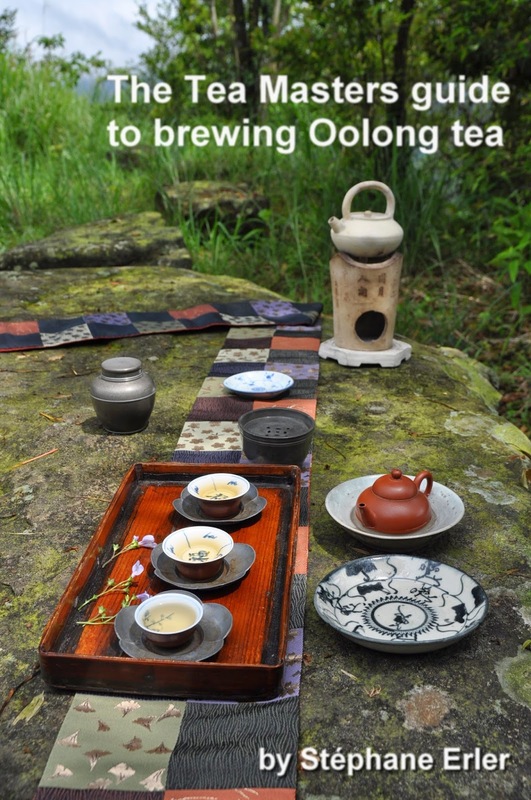 This coincides with the invention of Oolong, a tea that is more concentrated than green tea and that is therefore best tasted in small cups. A cup's size, shape, glaze, color, clay, firing... will impact the way the tea smells and tastes. Which cup to use therefore depends on the tea that is brewed. After giving further explanations about the theory behind all these factors, we tasted my Fenqi Hu High Mountain Oolong from spring 2015 using different cups. 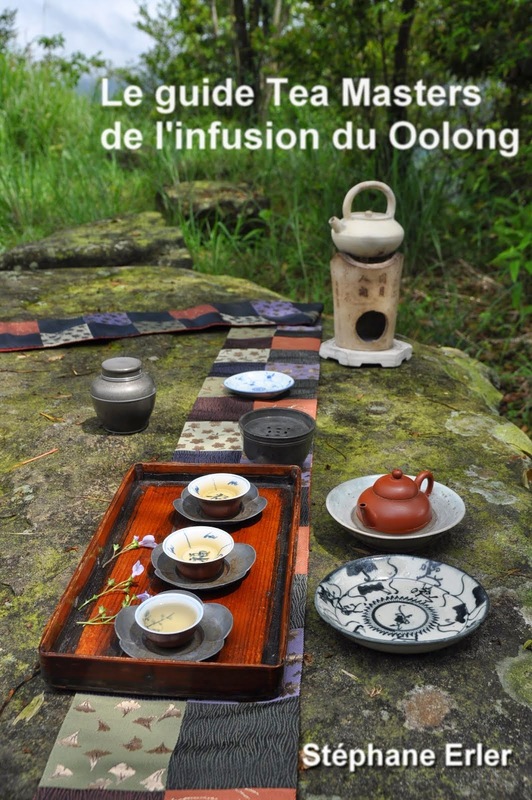 This Oolong's light but deep roast generates a very pleasant and powerful aftertaste and preserves the fine spring aromas of the high mountain. 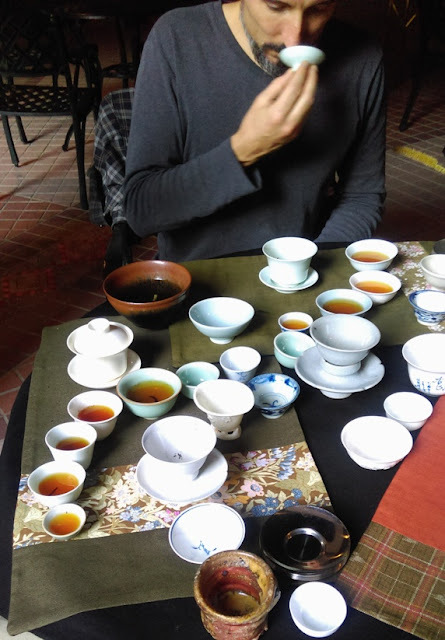 The first important finding was to confirm that the same tea indeed tasted very differently in each cup. Some had a more intense scent, for others it was mute. The color also appeared dramatically different very green in the light celadon cups and yellow in the white ones. 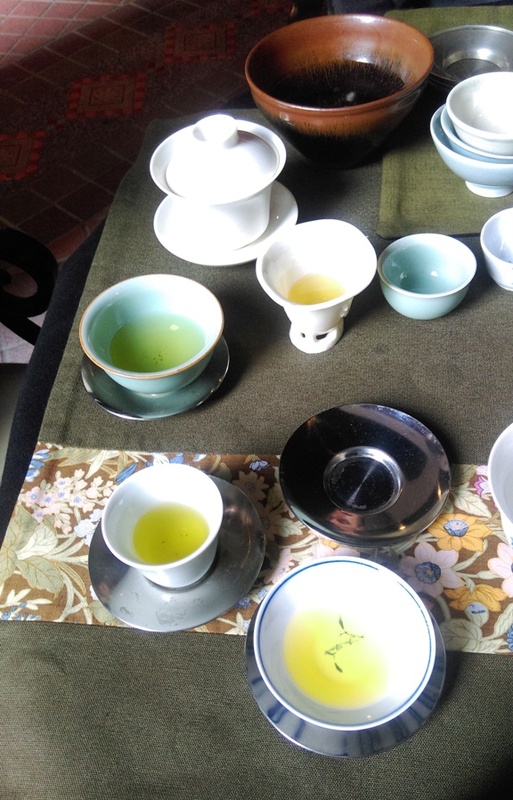 The celadon singing cup performed well on color, scent and taste. Cups with cracked glaze, however, often absorbed the light aromas of the Oolong and had disappointing results. A celadon cup from a famous Taiwanese ceramist failed to justify its fame. We then switched to a red tea, my spring 2011 old arbor Dian Hong. 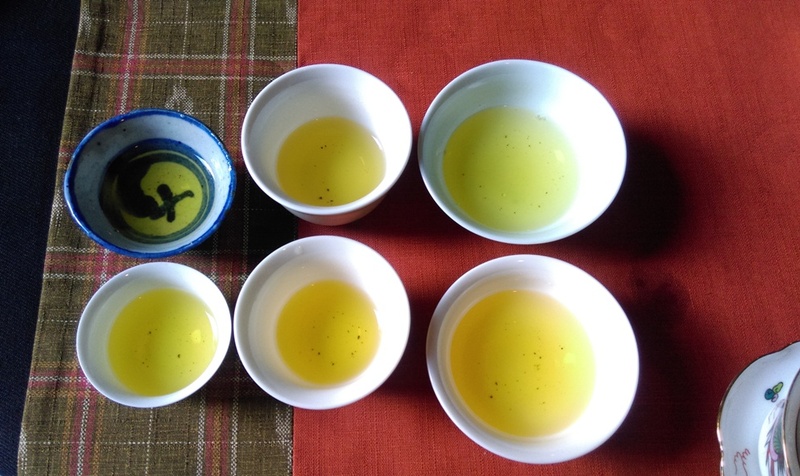 The golden buds of this tea are made with old puerh tree leaves. This gives them power and sweetness. This time, the color looks clearer, sharper in the ivory color cups. The flower cup performed particularly well with this tea, said Giovanni. The tea cup is the most intimate accessory: it's the one we bring to our lips. To appreciate its beauty, a cup is viewed almost like a person: it has a foot, a body, a neck, a lip, a mouth! 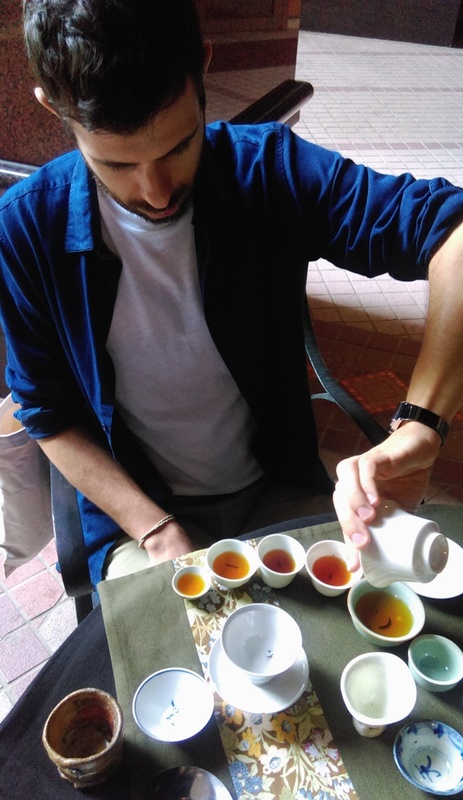 But this class has shown that the beauty of cup isn't just linked to its shape and color, but also to its use and how the tea tastes in it. Is the Cha Dao a road paved with violence?